Alabama Extension at Auburn University SNAP-Ed developed an original, creative, and engaging social marketing initiative to reach its target audience through social media, outdoor advertising, and text messaging. The campaign was branded Live Well Alabama with the tag line Eat Better, Move More, Make a Change to generate name recognition and establish SNAP-Ed as a reliable source for nutrition and physical activity information. Through research, brand development, and implementation of social media and traditional marketing strategies, the Live Well Alabama social marketing initiative has been successful in its first year educating and engaging individuals with limited resources. As a component of SNAP-Ed’s comprehensive, multi-level intervention efforts, the overarching goal of the social marketing initiative is to integrate SNAP-Ed resources into local communities and home environments in an effort to increase awareness of better food and drink choices and increase motivation for daily physical activity. Live Well Alabama successfully launched a social media campaign across three popular platforms: Facebook, Twitter, and Pinterest. Daily posts were designed to promote healthy eating and physical activity while encouraging audience participation through campaigns and shared success stories of SNAP-Ed education and policy, systems, and environmental initiatives. Social media was used to lead the target audience to the Live Well Alabama website for more comprehensive content. Most of the Live Well Alabama website traffic sources were referred via social media. The #FoodFriday recipe video series used Live Well Alabama recipes and garnered strong engagement on Facebook. For example, the Skillet Spaghetti recipe video post alone reached 11,700 people. 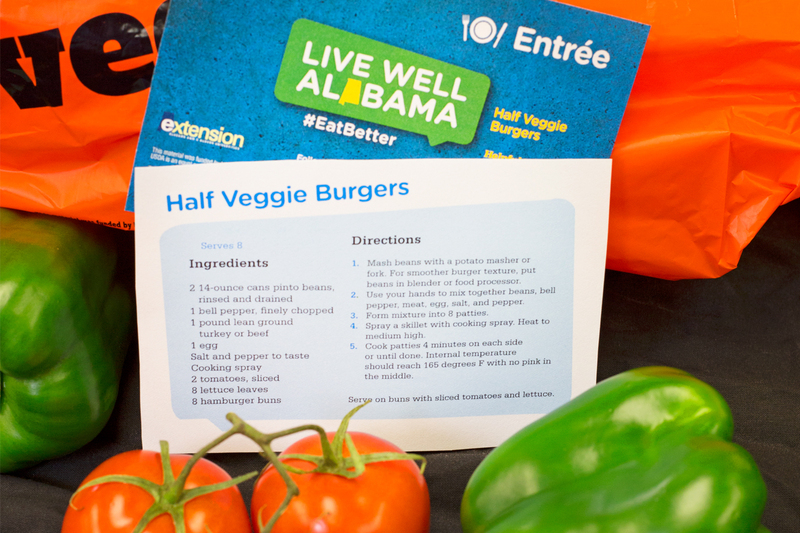 Live Well Alabama recipe cards were created to accompany the #FoodFriday recipe video series on social media. Click here for the recipe for Skillet Spaghetti. Facebook and Twitter polls were a fun way to interact with the target audience. The poll question “Which do you think has more sugar? Apple juice or chocolate skim milk” reached 9,760 people on Facebook. Live Well Alabama messages of Eat Better, Move More, and Make a Change blanketed the state through an outdoor advertising campaign including billboards and banners. For 12 weeks from January through March 2017, 93 billboards in 51 counties displayed each of the three core messages, changing every four weeks. Billboards resulted in more than 55 million impressions on Alabamians. In addition to billboards, outdoor banners and signs were posted in 27 locations in 10 additional counties where billboard space was unavailable. Alabama Extension at Auburn University SNAP-Ed is committed to reaching all corners of the state with messages encouraging residents to live well. SNAP-Ed partnered with Altarum, a nonprofit research and consulting organization, to conduct a cross-sectional phone survey to evaluate the reach and effectiveness of the billboard campaign. The survey included 433 respondents from 50 Alabama counties. More than one-third (38%) of respondents recalled seeing at least one billboard message. Survey respondents were asked questions about health views and behaviors, and responses were compared between those who were exposed and those who were not exposed to the billboard campaign. Respondents who were exposed to campaign messages were more likely to take action toward better health and reported higher intakes of fruits and vegetables compared to those who were not exposed to the campaign. Demographics: Most respondents were female (90%) aged 25-34 years (40%) and 35 to 44 years (36%). Respondents were mainly non-Hispanic, white (58%) or black/ African American (38%). Most respondents had two or three children in the household (63%). More than half (57%) reported participation in the National School Lunch Program’s free or reduced priced meals for children. 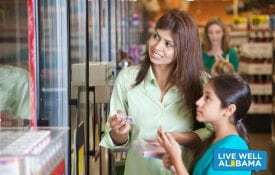 More than 40% reported participation in SNAP/EBT. Significant Findings: Two-sided t-tests of independent samples were conducted to compare fruit and vegetable consumption in the exposed and not exposed respondents. Respondents who were exposed to the billboard campaign ate more cups of fruit per day than those who were not exposed (1.8 and 1.3 cups, respectively) (p < 0.001). Respondents who were exposed to the billboard campaign ate more cups of vegetables per day than those who were not exposed (1.9 and 1.6 cups, respectively) (p = 0.001). A critical component of any social marketing campaign is ensuring that messages and images resonate with the intended target audience. SNAP-Ed partnered with Altarum to conduct a series of focus groups with SNAP-Ed–eligible adults in six diverse Alabama counties (Jefferson, Bibb, Barbour, Mobile, Washington, and Wilcox). In total, 64 SNAP-Ed–eligible adults participated in one of the six focus groups. Attendees were 91% female, 81% black/African American, and 19% white. Most attendees were single (72%), and most (71%) had at least one child. Nearly three-quarters (73%) reported that they or other members of their household participated in SNAP/ EBT in the past year. Through the focus group discussions, SNAP-Ed gained valuable insight into attendees’ attitudes, opinions, and reactions to the messages and graphics used in the billboard campaign and its potential to elicit behavior change. 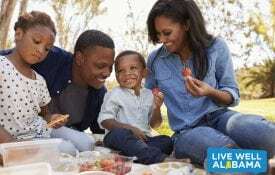 Responses to campaign messages were overwhelmingly positive, indicating a successful first year of the Live Well Alabama campaign. Suggestions for amending messages and images were considered in updating materials for future campaign cycles to ensure that Live Well Alabama continues to resonate with the target audience. A text messaging campaign motivated SNAP-Ed participants to make positive changes toward better health. The campaign attracted 782 participants, 69% of whom chose to continue receiving texts throughout the entire year, even though they could opt-out at any time. Text messages supported social media content and promoted the Live Well Alabama messages Eat Better, Move More, and Make a Change. Can Text Messaging Really Make a Change? A targeted intervention was conducted with SNAP-Ed–eligible women to examine the impact that participation in a texting initiative and receiving e-newsletters had on predicting behaviors for obesity prevention. Participants received two to three texts per day consisting of health and self-monitoring tips, goal setting prompts, reminders about exercise and healthy eating, and simple, low-cost ways to increase physical activity. Text prompts required participant feedback on self-monitoring daily step counts. 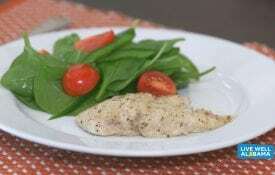 Participants also received a weekly e-newsletter with tips, reminders, and a low-cost, healthy recipe. Findings support that text messaging and online content are promising methods of education delivery and engagement with the SNAP-Ed audience. Evidence-based education delivered in this manner can improve dietary/physical activity behaviors and obesity prevention predictors in females with limited resources. Live Well in Schools: Direct education and policy, systems, and environmental changes move youth and parents toward better health.